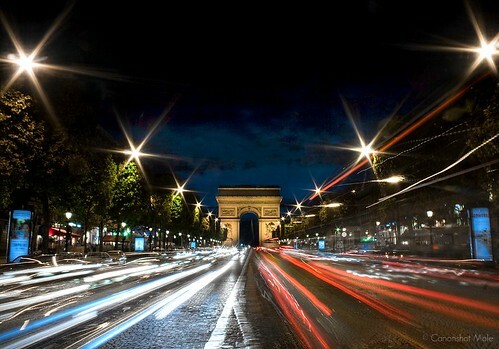 The Arc de Triomphe (8th Arrondissement) is a landmark of Paris located at the end of the Avenue des Champs-Élysées. Situation on Place Charles-de-Gaulle, the 164-foot arch is the second largest triumphal arch in the world. It was commissioned and constructed by Napoléon to pay tribute to his victories in the French Napoléonic Wars. It was not completed until twenty years after his reign in 1836. The monument was designed by Jean Chalgrin who was inspired by the Roman Arch of Titus. The Arc de Triomphe is intricately decorated with flamboyant sculptures, shields, and reliefs that together recount various military scenes from the battles of the Napoléonic Wars. The interior walls of the arch list the names of the 558 French generals who were involved in those battles with an underline on the names of those who died. While the major battles in which the French were victorious are proudly inscribed in the four supporting columns, Napoléon’s defeats at Elba and Waterloo are not included. The body of an anonymous soldier was placed below to arch on Armistice Day in 1921, an act to commemorate the soldiers who died in WWI. A flame of remembrance has burned above the tomb ever since, rekindled each night. The arch today continues to serve as the setting of major French celebrations and parades and is the famous finish line of the Tour de France. The arch also houses a small museum that tells the story behind the Arc de Triomphe. Be sure to climb the 284 steps or take the elevator to the top where you can enjoy the nice view of Paris and observe the twelve major avenues converging below on the roundabout. Dorling-Kindersley. Europe. New York: DK Publishing, Inc., 2004. ISBN: 0789497301.